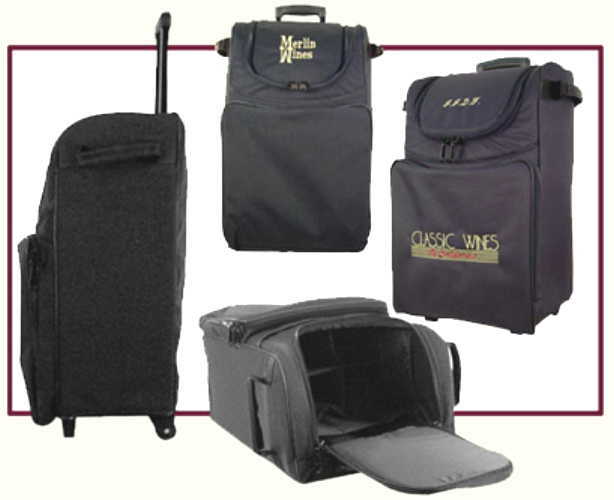 Wine Accessories Unlimited is proud to carry the best available wine carriers wine totes wine-on-wheels in the business. Our wine carriers wine totes wine-on-wheels rolling carriers are perfect for moving. They are constructed from the finest, toughest, yet most durable washable fabrics we can find. These are all top of the line quality bags. We do not sell poorly made totes. Life is too short to sell mediocre products. Why choose an inferior bag that will fall apart? We only carry the finest carefully selected selections of rolling wine carriers wine totes wine-on-wheels bottle carriers, insulated wine bottle bags & custom salesperson’s bags. We choose not to carry inferior bags & totes because these pieces are just not worth it. Why settle for much less when for a few dollars more you get the best.